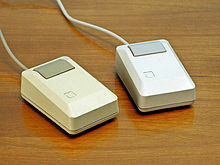 Engelbart's prototype of a computer mouse, as designed by Bill English from Engelbart's sketches. ↑ Engelbart, D. C. (1995). "Toward augmenting the human intellect and boosting our collective IQ" (PDF). Communications of the ACM. 38 (8): 30. doi:10.1145/208344.208352. ↑ "The Doug Engelbart Institute". The Doug Engelbart Institute. Retrieved 2012-06-17. ↑ "Ph.D. Dissertations – 1955". Electrical Engineering and Computer Science, College of Engineering, University of California Berkeley. Retrieved 2013-07-03. ↑ أ ب Thierry Bardini. "Turing Award Winners: 1997". Association for Computing Machinery (ACM). Retrieved 2013-07-04. ↑ "Douglas C. Engelbart". Hall of Fellows. Computer History Museum. Retrieved 2012-06-17. ↑ Edwards, Benj (2008-12-09). "The computer mouse turns 40". Macworld. Retrieved 2009-04-16. الصفحه دى اتعدلت اخر مره فى 16 نوفمبر 2017,‏ 08:48.